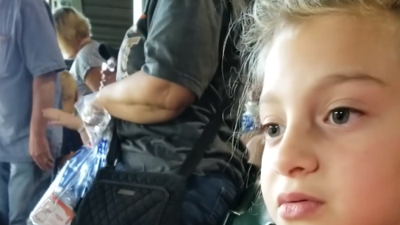 8-year-old Chloe had all of the fun taken away from her at a baseball game in Houston. The video shows the woman at the Astro's game turn around from the seat in front of the girl and shouted "ENOUGH!" That one word shouted from the woman quickly silenced the girl from all the fun. Chloe suffers from a condition called distruptive mood dyresgulation disorder, her mother Monica Beaver happened to be recording the game and unknowlingly captured what the lady had told her daughter on video. It was the next morning that Beaver saw on video what had silenced her daughter from having a good time at the baseball game. The mother posted to Facebook, "I didn't realize what was said and my daughter wouldn't tell us. I didn't even realize I got it on video until after I posted it and someone else told me. Trust me, after realizing this morning I was crushed because I obviously should've known." The video had already gone viral and Lance McCullers Jr., who is the pitcher of the Astros Tweeted out: "Chloe, don't you EVER stop cheering! I would love for you to cheer us on, as LOUD as you can, during ALDS game 1 in MMP! I would be honored to leave you a ticket!" People shared their thoughts on social media in regards to this heartbreaking incident.